Our brave, bright leaders in the General Assembly are considering a bill today that, if enacted, would ban over-the-counter sales of pseudoephedrine. The popular decongestant, marketed under various names including Sudafed, Allegra-D and ActiFed, is one of the primary ingredients used to make methamphetamine (crank, speed, crystal, ice, getgo, redneck coke, etc. ), often in small, homemade labs in peoples homes. 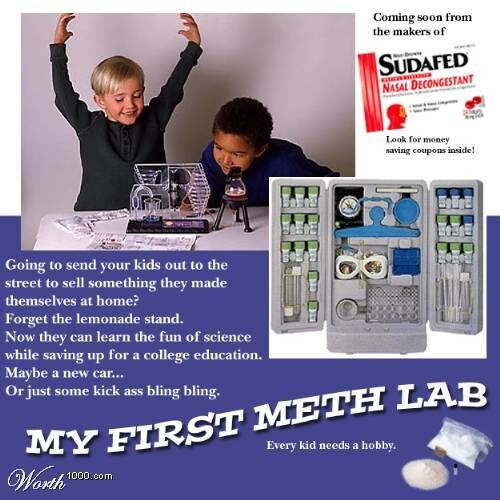 Meth labs have sprouted like weeds throughout the U.S., and use of the highly addictive drug has become epidemic. Police even found a meth lab in the home of a West Virginia sheriff's deputy. Hell, even Christians are getting in on the homemade crank bonanza: Police found a meth lab in a music practice room at the Fine Arts Center at Southern Methodist University. Drug enforcement agents warn that although meth labs are often considered a rural phenomenon, hundreds of them have been found in urban areas as well. In 2005, for instance, a woman was arrested for operating a meth lab in South Charlotte, a stones throw from the Quail Hollow area. With the possibility of meth labs showing up in the middle of Charlotte in mind, here are some tips weve prepared to help you detect whether a meth lab is operating in your neighborhood. Clip out these tips and save them on your refrigerator door. Youd be surprised how it will enliven your familys dinner conversations!  All their children and pets are named "Crystal," "Kristel," "Crystalle," and "CrisTal."  They trade in their Escalade for a liquid ton of acetone.  The smell of ammonia is drowning out your hubbys Polo aftershave.  The wife runs over one day and asks if she can borrow "a couple dozen hotplates."  When you say hello to them, your neighbors either jump up and down and wave at you for five minutes, or they run over and beat the crap out of you.  You accidentally receive and open their dentist bill, and it's $40,000.  Their daughter's Barbie doll has a little car with dark tinted windows and a toy rocket launcher on the hood.  They need seven recycling bins every week just to hold all the antifreeze containers.  That patch in the back yard where they poured out "the dog's bath water" is sprouting several varieties of glowing mushrooms.  When their child falls and scrapes her knee in your driveway, they say, "Oh, don't worry, we have a few barrels of iodine inside."  The husband sees you watching him as he hauls 100 pounds of Epsom salts out of the Hummer and explains that their daughter has "a mean case of poison ivy."  Their two-year-old has a "Smokestack Lightnin'" tattoo on his shoulder. * After Christmas, you saw the packaging below on their curb.